I read this for my year long challenge, because one of the challenges was to read a cosy mystery. It's a genre I've heard of, but had never read before, But I saw the first three of these books on Kindle for either free or for like 99p, so I decided to get them. I read just the first book, but I liked it a lot and I'll probably read the second two when I need something easy and, well, cosy, to get into. Charles Knox is the protagonist of the novel. Newly returned from South Africa, where he has made his fortune in gold mining, he is back in England meets up with his friend Bobs. Bobs invites him to Sissingham, where Charles' ex-fiancee Rosamund lives with her husband, Sir Neville. 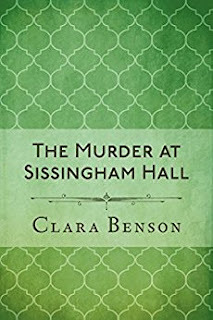 On arrival, there are several other people there, including Angela Marchmont, Rosamund's cousin, and Sir Neville's relatives Hugh and Gwen, who stand to inherit Sissingham should Sir Neville die. On the second night of Charles' visit, Sir Neville is murdered and his body is staged to make it look like an accident. Hugh is at the top of the suspect list, but honestly, no one is safe. This was a quick read, full of period drama and the foibles of the upper classes, and I really liked the 1920s setting. I enjoyed it, it's a cute little book.